This guide will teach you everything you need to know if you have a Thyroid Goiter in plain simple terms including how to approach diagnosis, what treatment options are available, the types of conditions that cause goiters and natural therapies. Does a Goiter Result in Symptoms? A thyroid goiter is simply a way to describe the size of your thyroid gland. The term goiter literally means an "enlarged thyroid" gland (1). It's important to realize that the term goiter is ONLY a description, and it is NOT a diagnosis by itself. Because that is the question that really matters. In some cases, the reason for your goiter may actually be reversible and in other cases, it may not be (2). Goiters are routinely found by Doctors during a physical exam. During a physical exam, your Doctor may feel your neck and notice that your thyroid is enlarged or simply does not feel normal. If this occurs then a workup should be started to identify if your goiter is actually causing problems or if it considered "silent". Another important point about Goiters is that they can manifest as all sorts of shapes and sizes. Traditionally we think of an enlarged thyroid gland caused by a goiter to be completely uniform or equally enlarged. You can think of this as basically hitting the supersize button on your thyroid gland so that it grows equally in all directions. While some diseases may cause your thyroid to enlarge in this way, many other causes of thyroid goiter may actually result in a lopsided or unequal growth of your thyroid gland. Conditions such as thyroid nodules (3), thyroid cancer (4), and thyroid cysts may result in an enlarged thyroid gland and therefore a goiter but these conditions certainly do not result in equal growth all over the gland. Most of these conditions result in an odd distribution of growth throughout the gland which can also be felt during a physical exam. Because thyroid goiters can come in all shapes and sizes it's important to discuss the various symptoms that may be associated with this condition. What's interesting about goiters is that many people who have a thyroid goiter may not actually experience any symptoms (5). These patients are often told, much to their surprise, that their thyroid gland is enlarged during a routine Doctors appointment. On the other hand, some causes of thyroid goiter may actually result in apparent symptoms that will lead you into the Doctors office looking for answers. The reason for this major difference between presentations among patients has to do with the CAUSE of the goiter. Let's say you have a thyroid goiter which is the result of the autoimmune condition Hashimoto's thyroiditis. If this happens to you, you may present with symptoms such as fatigue, weight gain, and constipation along with an enlarged thyroid gland. Compare this presentation to someone who has a thyroid nodule which is palpated on a routine physical exam during a Doctors visit. The patient with the thyroid nodule is probably not experiencing any symptoms and has no idea that they even have a thyroid nodule. The main difference between presentations has to do with the condition which caused the goiter to begin with. So with that in mind let's talk about the various ways that you may present if you have a thyroid goiter. Most people will not experience side effects relating to their goiter unless the goiter is sufficiently large enough to cause problems in the neck region. If it gets to that size then it may cause certain issues almost always relating to compression of anatomy in the neck. These symptoms tend to be rare because most thyroid goiters are caught before they end up large enough to cause these symptoms. More often patients tend to be what is considered "asymptomatic" (8) which means that they don't have any symptoms at all. Some causes of goiter also result in a condition known as hypothyroidism. This is a condition in which your body is not producing enough thyroid hormone. 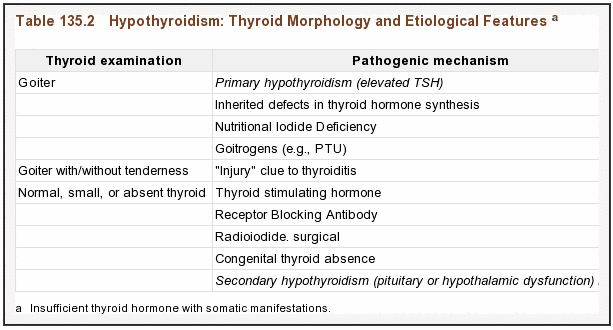 Conditions that cause both goiter and hypothyroidism include Hashimoto's thyroiditis (9) and Iodine deficiency (10) (both of which we will discuss below). These conditions are important because they may help to explain some of your symptoms. Hypothyroidism may also cause many other symptoms which you can read more about in this guide. In the exact opposite fashion, some other conditions may result in both goiter and excess thyroid hormone which cause different symptoms. Conditions that cause these symptoms include Graves' disease (11) and some toxic nodules. These conditions often result in the release of excess thyroid hormone into the bloodstream and characteristic symptoms of hyperthyroidism. The bottom line is that conditions that cause a goiter may also disrupt normal thyroid hormone function in the body. This is yet another reason why it is so important to identify the presence of a goiter but also continue your search for the CAUSE of the goiter. With that in mind, it's important to discuss what actually causes a goiter in your body. Believe it or not, the exact reason that your thyroid enlarges under all circumstances is not well understood. We do know for sure that certain conditions result in enlargement of the thyroid gland through inflammation, but other conditions are less understood. Studies have suggested that the cause of thyroid enlargement is most likely the result of multiple different actions. Even though we know that iodine deficiency can result in a thyroid goiter that doesn't mean that everyone who is iodine deficient will develop this condition. Instead, we see that certain individuals are more likely to develop a goiter if they also have a genetic predisposition and may be influenced by other risk factors such as pregnancy, other nutrient deficiencies and so on (12). This makes the development of this condition multi-factorial - which means that multiple factors are at play. The first condition that we are going to discuss which causes goiter, and perhaps one of the most important, is Iodine deficiency. This condition is important because it is a known and reversible cause of goiter (13) (not many conditions fit into this category). Iodine deficiency may result in a uniform enlargement of the thyroid gland which may cause a protrusion of the gland. Iodine deficiency is a condition in which there is insufficient iodine available for the creation of thyroid hormone. Whether you realize it or not iodine is required for proper thyroid hormone synthesis and an insufficient amount of circulating may lead to both goiter AND hypothyroid symptoms. The only way that humans can get iodine is from their diet. And the main source of iodine from food is from sea vegetables and from iodinated salt. How often are you eating sea vegetables such as seaweed or kelp? The answer is probably not very likely. And when it comes to salt many of the "specialty" salts such as Himalayan pink salt and Celtic sea salt may not be fortified with iodine. This sets up a situation in which iodine deficiency is probably much more common than we realize, even in "iodine-replete" areas (14) such as the United States. In fact, studies support this idea and show that even people in the developed world may have moderate to severe iodine deficiency (15). Other studies have suggested a link between recommendations for reduced salt intake (16) (for the benefit of your heart and blood pressure) and a decrease in iodine intake which may also be contributing to this increased risk of iodine deficiency among certain patients. The bottom line here is that iodine deficiency is a potentially reversible cause of goiter and should be seriously looked at if you have a goiter. Even if it isn't the primary cause of your goiter it may be contributing to some degree. You can learn more about supplementing with iodine and how to determine if it's appropriate in this guide. Another common cause of goiter among patients is thyroiditis. Thyroiditis is another non-specific term which is used to describe a state in which there is inflammation in your thyroid gland (17). Imagine what happens to your ankle if you twist it or imagine what happens to virtually any part of your body if you undergo minor trauma. The first thing that happens is that it swells up due to inflammation which in this case is actually a normal response. Now imagine this process occurring in your thyroid gland from either an infection, trauma or an autoimmune disease. It's easy to see how inflammation may result in "swelling" and, therefore, an enlargement of your thyroid gland. The difficult part about thyroiditis is that it is a non-specific condition and many diseases may result in inflammation to the thyroid gland. For purposes of this article, it's important to focus on the autoimmune diseases of Graves' disease and Hashimoto's thyroiditis. These conditions are important because they may result in a goiter and result in lasting damage to your thyroid gland either through treatment or as the result of time. Some other causes of thyroiditis may be temporary and completely fade away without any treatment such as postpartum thyroiditis. If you suspect you have thyroiditis then make sure that you read this article which outlines all of the causes of thyroiditis and various treatment options. Thyroid cancer may also lead to goiter. Thyroid cancer is the result of abnormal cell growth which may stem from the benign condition of a thyroid nodule. The growth of cancer tissues in your thyroid gland may result in increased "thyroid mass" and therefore a goiter. Fortunately, thyroid cancer is often caught early and boasts a 5-year survival rate of around 97 to 98% (18). Thyroid cancer is often treated with a condition known as thyroidectomy which results in the complete removal of the thyroid gland. Thyroid nodules are actually INCREDIBLY common and may account for a large percentage of patients with goiter. It is estimated that up to 7% of the world's population may have a thyroid nodule (19) and many of these patients are completely asymptomatic (meaning they don't experience any symptoms). Thyroid nodules are an important cause of thyroid goiter because they may progress to thyroid cancer over time. Because of this, it's important to identify their presence and then monitor them closely with certain tests with some regularity. Most of the time Doctors will monitor thyroid nodules with Ultrasound but sometimes a biopsy may be necessary. Another important cause of goiter is secondary to certain prescription medications. This is especially important considering the role that modern medications play in the treatment of many chronic diseases such as hypertension, cardiac problems, cholesterol and so on. It's not an uncommon occurrence if you are over the age of 50 and you are taking multiple medications (20). What may surprise you is that certain medications are considered to be "goitrogenic" meaning they may induce the formation of a goiter. Thyroid function is complex and from start to finish includes the production, activation, conversion, and cellular function, all of which are required for proper thyroid hormone signaling in the body. Prescription medications may interfere with 1 or more of these important points and may, therefore, result in decreased thyroid function in the body (21). Medications that fit into this category include steroids, amphetamines, beta blockers, diabetic medications, antiseizure medications and so on. Very few medications result in complete and irreversible thyroid damage but many medications may cause a low-grade dysfunction in thyroid regulation. If you suspect that your medications may be contributing to your goiter then it may be worth looking into alternative medication options. Goitrogenic foods are foods that may increase your risk of developing a goiter. Goitrogenic means goitrogen forming, so it makes sense that consuming goitrogenic foods may increase your risk of developing a goiter. But what kinds of foods fit into this category? It may surprise you to find out that many foods that may impair thyroid function are actually vegetables. Consumption of large amounts of these goitrogenic foods may block the absorption of iodine into the thyroid gland (22) and may lead to a decreased production of thyroid hormone. This is something that should be evaluated on a case by case basis though. The reality is that most people are not consuming anywhere near enough goitrogenic foods (or vegetables) to impair thyroid function. It is more likely that certain individuals are more susceptible to developing a goiter when consuming these foods but only because of other risk factors. If you have known thyroid disease and a known thyroid goiter then it may be wise to limit your consumption of brassica vegetables (23) but it doesn't mean that you have to completely avoid eating them (which may not be a healthy alternative). Thyroid cysts, although not necessarily common, may result in thyroid goiter as well. Thyroid cysts are usually benign (meaning they don't cause any issues) and tend to stem from overproduction of colloid fluid in thyroid tissue. Thyroid cysts are usually identified with ultrasound imaging and can be monitored in the same way. Have you heard the saying that an ounce of prevention is worth a pound of cure? This holds true for goiters as well. In many cases, the best "treatment" for a thyroid goiter is to prevent its formation in the first place. So is it possible to prevent? The best way to prevent the formation of a goiter is to limit or reduce risk factors that are known to increase your risk of developing a goiter in the first place (24). Pregnancy - Pregnancy puts an increased demand for iodine usage in the body and may exacerbate mild deficiencies. Breast Feeding - Breastfeeding, like pregnancy, also increases the demand for iodine in your body and may exacerbate mild deficiencies. Diet poor in iodine - A diet which follows the "Standard American Diet" and one which is limited in sea vegetables such as seaweed, kelp, and iodinated salt may increase your risk for developing a goiter. Diet high in goitrogens - We've discussed this briefly but it may not be wise to consume massive amounts of goitrogenic foods, especially if you have a family history of thyroid disease or if goiters run in your family. Not all of these risk factors can be avoided (for instance if you've been exposed to radiation there isn't likely a way to fix that), but if possible you should attempt to avoid known risk factors. Treatment for your goiter really depends on what caused it to begin with. Comprehensive physical exam and medical history - A medical history can give you the insight to help determine the cause of your goiter. Complete thyroid lab testing: TSH, Free T3, Free T4, Total T3, Reverse T3 - Thyroid lab testing will help determine if your thyroid function is in jeopardy. Thyroid Antibodies (Thyroglobulin antibody, TPO antibodies, and Thyroid Stimulating Immunoglobulins) - The presence of thyroid autoantibodies will help you to determine if your goiter is due to autoimmune disease or thyroiditis. Thyroid Ultrasound - Thyroid ultrasound can help determine if you have a thyroid nodule, assess your risk of thyroid cancer and help determine if your goiter is secondary to a cyst or something else. Other Blood Tests - Other blood tests such as those that check for nutrient deficiencies or inflammatory markers may help determine the cause of your goiter. Iodine Testing - A simple way to assess for iodine deficiency is to check for iodine status in the body and this should be ruled out as a cause of goiter. Undergoing these basic tests will help you discover the underlying cause and may also help direct treatment. Even after these tests are accomplished (and the results are in) there are several ways that your Doctor may approach treatment. If the cause of your goiter is due to something like a thyroid nodule, a thyroid cyst or Hashimoto's thyroiditis then the best approach to treatment may be what is known as the "wait and see" approach (25). This is an approach where the size of your thyroid and your thyroid lab tests will be closely monitored on a regular basis. This will help determine if anything is changing or if your condition is worsening. This type of approach isn't the most pro-active approach but it may be necessary, especially if you are simply monitoring a thyroid nodule or a cyst. Even if the approach to treatment does not include active therapies it still may be a good idea to consider alternative therapies (more on these below) such as dietary changes and the use of certain supplements to see if you can impact your goiter. As long as these therapies are not harmful to your existing condition then there is very little risk and potentially a lot of benefit to them. Radioactive iodine ablation is a therapy which results in the destruction in part or all of the thyroid gland. This damage occurs through the use of radioactive iodine ablation which is given to the patient. Radioactive iodine ablation (also known as RAI) is typically used to treat Graves' disease or other conditions which result in overproduction of thyroid hormone and hyperthyroidism (26). Because some of these conditions may result in a goiter it's important to discuss. Complete surgical removal, otherwise known as complete thyroidectomy, is a surgical procedure in which a surgeon completely removes your entire thyroid gland. Thyroidectomy is usually used to treat conditions such as Thyroid cancer, Graves' disease and some causes of thyroiditis (27). The complete removal of your thyroid gland results in a state in the body in which you can no longer naturally produce thyroid hormone. Patients who undergo this operation are therefore required to take thyroid hormone replacement therapy indefinitely. Thyroid hormone replacement therapy may be used to help treat patients in which their goiter is limiting thyroid function in their body. This condition is referred to as hypothyroidism and may be the result of patients who experience goiter secondary to Hashimoto's thyroiditis, Iodine deficiency and those who may have undergone a complete thyroidectomy or RAI. The use of thyroid hormone replacement therapy is a comprehensive and complex topic and if you are currently taking medication you should look at the links above for more information on these topics (depending on which medication you are currently using). Aside from conventional therapies and treatments, there is also a demand for alternative or complementary therapies to treat goiter. As with many alternative therapies, there are fewer data supporting its use, but the data that exists does tend to show positive results. The key to using natural therapies is to capitalize on those therapies which are not likely to be harmful in the long run and those in which have been well studied. We know that it's not a good idea to eat the "Standard American Diet" because it leads to an increased rate of chronic health disease in major categories (28) ranging from heart attack to cancer rates. It is, therefore, a really good idea to "clean up" your diet and focus on consuming healthy foods that are rich in nutrients. You can take it one step further and exclude those food groups which may be goitrogenic (or at least limit the amount that you consume in this category). Consuming a healthy diet that is rich in natural food sources such as healthy nuts/fats, fruits, and non-goitrogenic vegetables is something that may potentially impact your goiter and one in which is very unlikely to cause any harm to your body. This should go without saying and should be the first step you take if you are pursuing natural therapies. The next set of therapies, in the alternative world, include the use of nutritional supplements. There are good arguments to be made for the use of targeted supplementation especially for those who reside in the United States. Due to soil depletion, the distance that fruits and vegetables have to travel to make it to the supermarket and the decline of nutrients in foods that are not picked "ripe" there are plenty of reasons that you may not be consuming adequate nutrients in foods. This doesn't take into account the reliance upon processed foods which may also promote inflammation and various gastrointestinal disorders such as IBS and IBD. We know that iodine is critical for the production and synthesis of thyroid hormone (29). In the absence of adequate iodine consumption from sea vegetables and iodinated foods, it may be wise to consider the use of iodine supplementation. 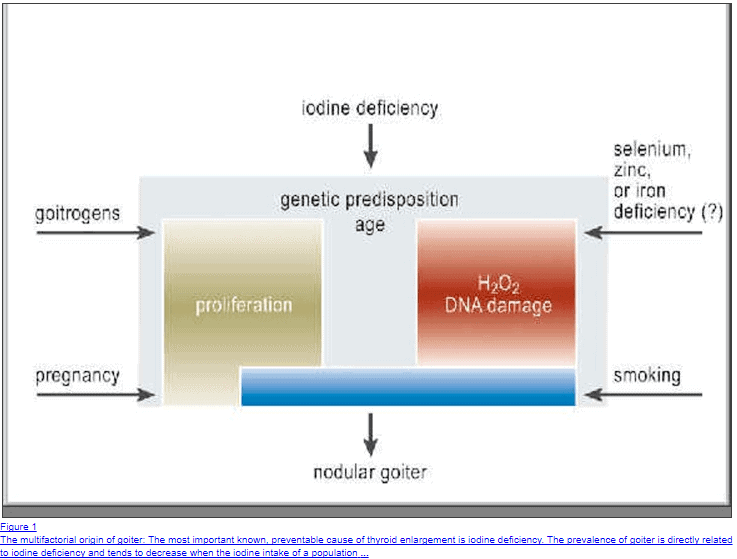 Supplementing with iodine may improve or reduce your goiter IF the cause of your goiter is from iodine deficiency. As I've discussed previously it's much more likely that your goiter is the result of multiple conditions that are "stacked" on top of each other and one in which these conditions all create the "perfect storm". Even in this scenario it still may be worth considering the use of iodine to help improve thyroid function. Zinc is an essential trace mineral which is also very important for thyroid function in the body. Studies have shown that elderly individuals who are zinc deficient (30) show an improvement in thyroid hormone function with supplementation. Zinc helps convert T4 into the active T3 thyroid hormone (31) and also acts as an inflammatory agent in the body. Many patients may have sub-optimal zinc levels in their body due to the same reasons they may be iodine deficient. Selenium is another important nutrient, especially as it relates to thyroid function. Selenium is important in that it is an important component of several enzymes that help convert thyroid hormone, promote the formation of antioxidants and help promote proper metabolism. The use of selenium has also been shown in studies to help reduce autoantibodies in Hashimoto's (32) in certain patients. Iron is another nutrient that plays an important role in thyroid function. Like the other nutrients, many people may also have sub-optimal iron levels even though they are not necessarily anemic. Testing of ferritin (and other iron markers) can help identify early iron deficiency. If you have a known thyroid problem or a goiter then evaluating your iron status may be very important. You can learn more about the interaction between iron and thyroid function in this post. Goiter is a non-specific condition which refers to an enlargement of the thyroid gland. The title of goiter says something about the size of your thyroid but it doesn't say anything about the CAUSE of this condition. People who have a known or suspected thyroid goiter should, therefore, undergo testing and evaluation to help determine that cause. Once they have further information they can make an informed decision about treatment (either conventional or alternative). If you are concerned about developing a goiter or if you have a strong family history of this disease then make sure you try to avoid the risk factors that were discussed in this article. Do you have a thyroid goiter? What is the cause of your goiter?